It should be no surprise that, like most technologies, the military is one of the first places ultrasound frequency alteration of the brain becomes popular. Researchers now working at DARPA have discovered a device that not only improves the mind, but does so in the field of combat. Will we soon be facing a world where soldiers in the field (and perhaps off) wear bizarre helmets that serve to control their very minds? Years ago reflexive and immediate brain augmentation and management was achievable only through the invasive implantation of electrodes into a person’s grey matter and the attachment of these electrodes to a machine to interpret signals and react accordingly. Fortunately for DARPA’s research, thanks to the efforts of Dr. William Tyler and his team, a better way has been found. Essentially the helmet works to pierce the skull with high frequencies and actually penetrate deep into all areas of the brain, causing soldiers to activate different portions of the brain. Future models may be able to reduce pain, heighten focus, and improve other aspects of the brain’s interaction with its environment. Essentially the helmet hopes to turn an ordinary soldier into a hyper-focused combat machine. 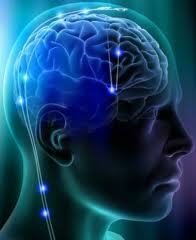 Originally the research was intended to repair injuries and prevent traumatic brain damage due to injury. The theory was that the machine could penetrate deep into the skull and provide those injured with a means to prevent long term brain damage. Traumatic brain injury doesn’t necessarily damage cognitive functioning immediately, but rather eventually causes swelling which can injure a person’s cognitive functioning. The device hoped to intervene during this time to change the brain’s structure slightly and save an injured soldier from further damage. Then the device was moved into more preemptive applications. If a soldier is focused enough, perhaps he or she would not even be injured in the first place. The potential applications are widespread to say the least. If focus can be achieved through application of ultrasound immediately, then sleep deprivation, combat fatigue, traumatic stress, and even fear may be affected in the future. Could pain be turned off on more advanced machines? What about aggression or the removal of moral and ethical reflexes? And then there are the potential applications for shutting down long term memory. Imagine an army of soldiers no longer capable of remembering the horrors of war, or even that they have been to war. How far can this mind manipulation go in a technical sense? And how far, in an ethical sense, are scientists willing to take it? When we are attaching electrodes to the brains of our soldiers, the ethical ramifications don’t seem to be of immediate concern. And these ethics may get even further behind if a more desperate major war were to arise. With the first two world wars we soon saw airplanes performing maneuvers previously thought unimaginable, mustard gas, and guns capable of firing thousands of rounds in a single sitting. With these devices coming out from the technology available less than a hundred years ago, what new horrors would come out at the next war?